Are you looking for a best, affordable backpack with multipurpose features for your daily usage? Are you looking for a backpack which is suitable for both work and travel? Looking for a water repellent backpack to carry your costly gadgets while going out? Here is the Seute Verdiater Backpack, which is the answer to all the above questions. Seute is an Indian company based in Pune. This startup was Incorporated in 2017 and their goal is to create robust, ergonomic and high-quality accessories and bags. The company has already launched Bruxmann, Teck, Teck Pro backpacks. The company ensures to improve the features and the quality of their products in each of their next launches. In the row, the company’s recent launch is the Seute Verdiater, which is the best of their backpacks when compared to the previous launches. Seute Verdiater is a backpack which is suitable for many occasions like work, carrying gadgets, blogging and travel. This backpack has a lot of well-organized compartments to carry our gadgets and a lot of space for holding the other items, USB charging port and the backpack is made of high-quality water-repellent PU material. The Seute Verdiater is made of a high-quality water-repellent PU material. This time the company has released this Verdiater backpack in a single colour which comes with the combination of Black and Grey which looks decent. The overall design of the bag looks professional and suitable for work and travel. The zippers on all areas on strong, high quality and durable. The net weight of the backpack is less than 1 kg [0.93 kg], hence it is easy to carry. The bag is capable of carrying up to 15 Kgs of weight. 1 Quick access zippered pocket for small accessories. The main compartment has a 180-degree opening and it has the pockets for Laptop up to 15.6 inches, Tablet, Wires, power banks and more. Also, there is an extra space which can be used to carry some extra items like dresses, camera or any other items which are needed for travel. On the right side, we have the USB extension port, Removable & Washable pocket for shoe/wet clothes/Tiffin box. There is a secondary compartment on the front, where we have the key holder, pockets to carry mobiles, power banks, pens and a zipper for carrying documents/wires. On the front, we have a side opener which has a small pocket which is also called a quick access zippered pocket to carry the primary mobile or any other small accessories. On the shoulder strap, we have a small pocket with zipping to carry money or tickets while travelling and we have the Goggle Holder. On the left we have an open pocket to carry small water bottles, torch, etc., Also we have the Luggage sleeve for easy attachment to rolling luggage. The backpack is capable of water repellent as well as water resistance. 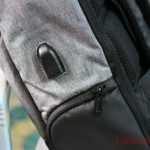 I have tested pouring a huge amount of water on the backpack and it repels as well as resist the gadgets and the items inside the body, but make sure the zippers are closed properly till the end. After using this bag, a few times I was caught in the rain and the water repellent and water resistance features saved my gadgets. But, make sure to double safety your costly gadgets in the heavy rain. The removable Multi-Purpose Pocket, which can be used to carry your Tiffin for Office, or Shoes for Travelling, or even wet clothes when on an Outing. This pocket is really useful and doesn’t worry if you place a dirty shoe or wet clothes, this pocket is removable and washable. The bag is capable of carrying all the above items at the same time, which is easy for many of us to carry all the needs for a short travel. You can buy the Seute Verdiater Backpack on their official website and other various platforms. Here is the buy link from Seute Website and Amazon India. Seute Verdiater Backpack is the best backpack I have used till date which is suitable for travel and work. The backpack looks very professional while wearing. This backpack is my daily driver for the last 3 weeks and I really liked it. The backpack is suitable for carrying my gadgets on a daily purpose and also it is compact our travelling where we can carry a dress, gadgets and even shoes in the same bag. Also, the water repellent feature saves the gadgets and other items from the water. Also, the pricing is decent and for the price, the backpack is really worth every penny spent.